Overview: Of all the Magnolia genus, the Star Magnolia (Magnolia stellata) has the best qualities for bonsai. 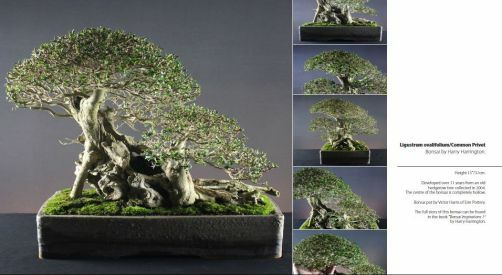 However, it is still a difficult species with which to create a successful bonsai. The Star Magnolia is a slow-growing, deciduous shrub with a dense bushy habit. Unlike some Magnolias that can take 20-30 years to flower for the first time, M. stellata bears white star shaped flowers on it's bare branches at a very early age. Due to it's relatively large flowers (5" across) and leaves (4" across) it tends to suit medium to large sized bonsai. It is most commonly seen in single or multiple trunk informal upright styles. Obtaining good material for bonsai is difficult; even when grown in the ground, Magnolia trunks take many years to thicken. General Cultivation: Position in full sun or partial shade. Protect frosted flowers from the early morning sun as rapid thawing discolours and shortens the life of the flowers. Magnolias are otherwise fully hardy down to -10 degrees centigrade (14 F). Feed every two weeks whilst the tree is in leaf using a balanced fertiliser, from August the use of a low-nitrogen feed is recommended to harden the years growth in preparation for the winter. Repotting: Repotting should be carried out in early spring as the flower buds start to extend. Magnolias dislike root disturbance and should only be repotted every 3 years, remove only 1/3 to 1/4 of the rootball. Use a basic bonsai soil mix. Contrary to popular opinion, Magnolia stellata does not require acidic soil; rather it dislikes lime/alkaline soil. Neutral to acid soil is sufficient. A twice yearly acid-based feed will neutralise any lime or alkaline in the soil. Pruning: Prune back hard to shape after flowering - try to anticipate the growth that the tree will make in the following weeks. M.stellata puts out the majority of it's years' growth in the 5 or 6 weeks after flowering. In late June prune back to shape. After this time, next years' flowerbuds will be forming and further pruning will result in fewer flowers the following Spring. Propagation: Magnolias are easily ground or air-layered in late spring. Root greenwood cuttings in early summer or semi-ripe cuttings in early Autumn. Pests and Diseases: Magnolias are relatively disease free. Yellow leaves are a sign of an alkaline soil and an acid-based feed should help green up the foliage. Aphids can occasionally be a problem. The main pests to be aware of are scale insects, particularly around flowering time. Either spray with Malathion before the flowers open or rub off with fingers. Do not spray open flowers with insecticides, as they will discolour.